They're at capacity this week at the Hilton Garden Inn in Fargo. More than 350 people are gathering to hear keynotes like "What Got You Here Won't Get You There," plus table talks, breakout sessions and a closing talk asking "Where Do We Go From Here?" It's not a life-coaching class or a religious convocation — it's the 2018 Conservation Tillage Conference, and they're there to talk soil. 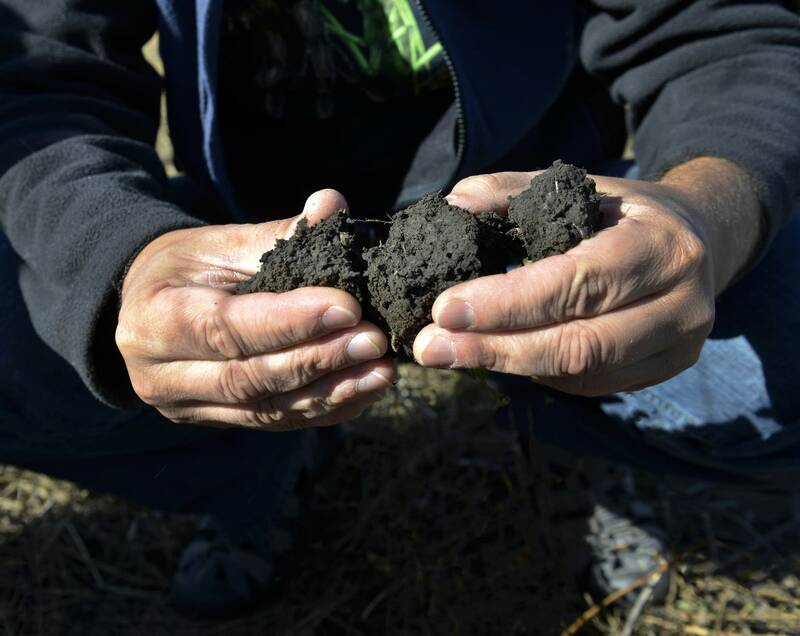 The jam-packed sessions on soil health this week are evidence of a growing movement to change farming practices, said Jodi DeJong-Hughes, a University of Minnesota Extension educator who has been helping to organize conservation conferences for 14 years. This year, they had to turn away farmers and vendors. "It was surprising," she said. "I mean, we've had growing interest, but this year it really took off." The focus of the soil health movement is a major change for most farmers: It encourages them to stop tilling the soil, and plant cover crops after harvest so the soil is always covered by plants. Most Minnesota farmers still till their fields, but DeJong-Hughes said she sees a growing number who recognize that tilling isn't sustainable — and they are intrigued by the idea of innovation. "It puts the fun back into farming, and it puts thinking back into farming," DeJong-Hughes said. "It's not just, what is it and how do we kill it. What weed, what pest, what disease. It's how can I improve something, how can I make healthier soil." For 25 years, Steve Groff has been preaching the benefits of using a system of cover crops and no tillage. He's a Pennsylvania farmer and was the opening speaker at the two-day conference. "It's becoming almost mainstream to at least be able to talk about cover crops," he said. "I can't say cover crops and no-till has become mainstream, but to talk about them [doesn't carry] the stigma that it used to." He told farmers Tuesday morning that changing the way they farm isn't easy, but it will be necessary, "because we live in a rapidly changing society, and farmers will be impacted by that," he said. "They better stay up to date on what's going on, so that they don't become obsolete." Groff said he sees growing pressure from consumers and corporations who want their food to be produced more sustainably. Most farmers, he said, understand that they need to do more to protect the environment. "I think farmers kind of intuitively know that, at some point, they're going to have to justify every pound of nitrogen that they use on their farm," he said. Excess nitrogen that runs off of farm fields can pollute streams and drinking-water wells. DeJong-Hughes understands that many farmers need to be persuaded that making changes to the way they've farmed for decades makes economic sense. She said she believes farmers can save money and improve water quality by planting cover crops and not tilling the soil after harvest. Those practices can reduce the need for costly nitrogen fertilizer and pesticides. She said things like Minnesota's controversial buffer law, which protects streams from farm pollution, is a symptom of current farming practices. "Putting a buffer at the end of the field traps what came off that field," she said. "That's great, but what I want is that soil never to move to begin with, but keep it where we can use it and keep all those nutrients where the farmer put his money." In more than 20 years working with the extension, DeJong-Hughes said, she's seen trends come and go. But this one, she said, is no trend. "With soil health, it's not going away," she said. "People are getting more and more interested in it." And with sessions like "Where to Start with Cover Crops" and table talks like "Focus on Efficiency" this week in Fargo, she's hopeful that showing farmers that they can stay profitable after switching to more sustainable methods is the best way to help them move from interested to in.